*Data from Bowen Craggs survey data, which indicates that 69% of corporate website jobseekers come specifically to search for a job; and that goal achievement affects brand perception: only 24% of those who failed their task leave with better brand perception. SAP is embracing Glassdoor as a channel through which to engage with employees and respond to criticism. But oddly it seems reluctant to shout about it. We wrote almost two years ago how SAP has established a vibrant presence on Glassdoor, the site where employees can leave reviews of companies as employers. The company has invested time and money in creating an enhanced employer profile, on which it displays awards and feeds from its other careers-focused social channels such as Twitter and Facebook. It also posts updates directly, and has created other bespoke information on life at SAP. A closer look reveals that the company responds to both positive and negative employee reviews – the central part of Glassdoor. For example, on February 4th 2018, the company thanked an employee for a 5-star review, while on March 7th it engaged with an employee who had posted a review titled ‘Trash’ and which complained about sexism, racism and homophobia. The company detailed its efforts at inclusion, apologised to the employee for their experience, and provided an email address for the employee to take matters up with the HR team. On the SAP website, Glassdoor is not included in the links to social channels in the footer. 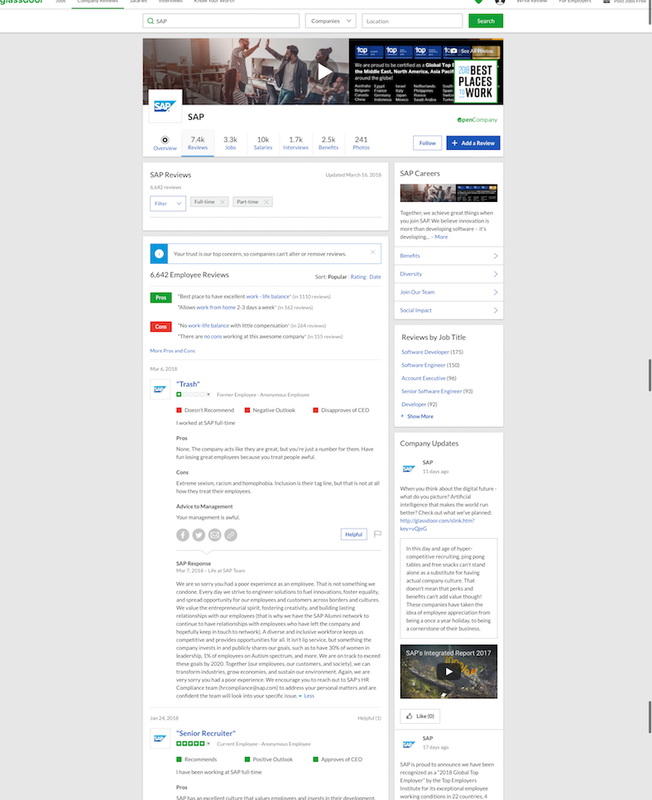 The company’s Glassdoor profile is advertised on a page at SAP Careers > Who We Are > Social Media Channels, but this page is quite hidden in the site – not in the navigation and only accessible via small links on other pages such as Careers > Who We Are. Unlike two years ago, there is no advert on the Careers landing page for the Glassdoor presence (only a reference to a Glassdoor award). SAP’s activity on Glassdoor shows how employers can engage with employees and show how transparent they are. There are alternatives to this approach: this recent PR Week article sets out the legal avenues to have posts removed, or prevented in the first place. While these options may be useful in extremis, such as if an employee at the company in question has been identified, it is preferable to demonstrate transparency by facing negative reviews head on. Given that employees will be posting reviews – both positive and negative – on the site, whether a company has chosen to tailor its presence there or not, it makes sense to respond to criticism and put forward the company’s point of view. There is evidence to back up the benefits of this approach: a 2016 Glassdoor survey found that 62% of jobseekers said a response to a negative review would improve their perception of a prospective employer. However SAP’s seeming reluctance – or perhaps it is just oversight - to publicise its engagement on Glassdoor seems odd, and to undermine its efforts there. Other companies such as BNP Paribas do a much better job of showcasing their Glassdoor presence. Deutsche Telekom offers an unusual way for jobseekers to interact with the company. The corporate website exists in English and German, and on the German version a blog alerted us to the existence of a chat bot, ‘KATY’, in the careers section of the subsidiary T-Systems Germany site. KATY appears as an overlay panel available on the right-hand side of all pages in the section; users simply type in questions and the answer is provided (or not). The bot did not prove that useful. We asked it several simple questions in both German and English, and most of the time received a standard message that it could not help us. Even when we wrote, in German, that we were looking for jobs in Stuttgart, we were simply directed to the job search mechanism, rather than a listing of available jobs in Stuttgart from the job search site. The fact that Deutsche Telekom is prepared to use a chat bot – and to advertise it on its blog and other channels, such as its Whatsapp messenger service – is perhaps as much about reinforcing its credentials as an innovative tech company than providing services of real use, at least at this stage. In mitigation of KATY’s deficiencies, the blog publicising the release of the bot states clearly that it will not be perfect yet and that, as an implementation of artificial intelligence, it needs to learn from successes and failures. Only offering the bot on a subsidiary country site, at this stage, seems sensible too. The blog also says humans at T-Systems will sometimes help the chat bot as it learns. This seemed to happen when we asked it about company benefits. We initially got the reply that KATY could not assist, but then several minutes later received another answer – presumably from a person – setting out some high-level information on company benefits, although there were no onward links and many jobseekers may have given up on KATY by then. As ever, the success of using new technologies relies on the skill and effort of the humans behind them. An online chat feature gives a wide range of options for jobseekers to ask questions about the company and recruiting process. UnitedHealth Group, a US-based health insurance giant, offers online chats with company recruiters in the careers section of its corporate website. There are chats in nine functional areas, including ‘clinical’, ‘college’, ‘consulting’, ‘customer service’, ‘technology’, etc. Each of these has further ‘areas of interest’- for example, under ‘Clinical’ there are links for physicians, pharmacy, behavioural health. Days and times are given (in US central time), with links to access the chat. A 2-minute video explains how to prepare for the chat and what kinds of questions to ask. The web page also suggests jobseekers ask about benefits, the business, CV-writing tips, interviewing tips and locations. If jobseekers cannot make the chats at the specific times, they can email questions; and there is an FAQ. The section is responsive so jobseekers can access it on a smartphone. UnitedHealth’s recruiter chats are unusual for their breadth of options and flexibility. The range of functions means there is likely to be an option for most jobseekers, and also gives an immediate sense of the numerous career paths on offer. FAQs and chance to email questions are useful options for those who can’t make the specific time. The video is welcoming, straightforward and informative; and will encourage uptake. It is a good way to make the company seem friendly – and perhaps give recruiters a chance to cherry pick especially promising talent. A pharmaceutical uses a video Q&A on social media to explain a senior role and attract candidates. Roche, the Swiss healthcare giant, is recruiting for a head of public relations. The company published a video on YouTube this month, in which a member of the ‘Talent and Acquisitions’ team at Roche interviews James Woodhouse, Roche’s director communications, about the role. In the five-minute video, Mr Woodhouse describes the role, the kind of person they are looking for (eg, someone who can help manage controversies and be an ‘ethical compass’), practical details such as the size of team that will need managing; and opportunities for career progression. The video is housed on Roche’s YouTube channel, and we saw it promoted on Roche’s LinkedIn and Facebook careers feeds. At the end of the video, candidates are invited to send ‘video applications’ via a link on the corporate website. Roche’s YouTube recruitment video is innovative use of the online channel to ‘sell’ the idea of working for Roche and the specific role on offer. When used in this way, video is an effective way to go beyond a written job description – giving jobseekers a fuller description of the role and opportunities in the organization; as well as to introduce the culture and their potential boss. The five-minute length seems about right – it might be too long for other corporate videos, but in this case, interested candidates are likely to watch until the end. Candidates will also have a better idea of the tone they should take in their own video applications. A simple, friendly page with campus recruiter biographies could be adapted for other corporate careers sections. The campus recruitment section on Oracle’s corporate website has an ‘Overview’ page that introduces its team of university recruiters that cover North America. There are nineteen short profiles, each with a one-paragraph biography, smiling headshot, an invitation to make contact via LinkedIn and ‘quick apply’ link, which leads to Oracle’s Taleo application management system. Oracle’s welcoming and social media friendly biographies strike the right tone for US university students looking for job opportunities. Some of the US-centric details of the page could put off international audiences – lots of smiling and ‘fun facts’, etc – but its benefits in helping jobseekers get to know a company’s recruiting team is an idea worth adapting. 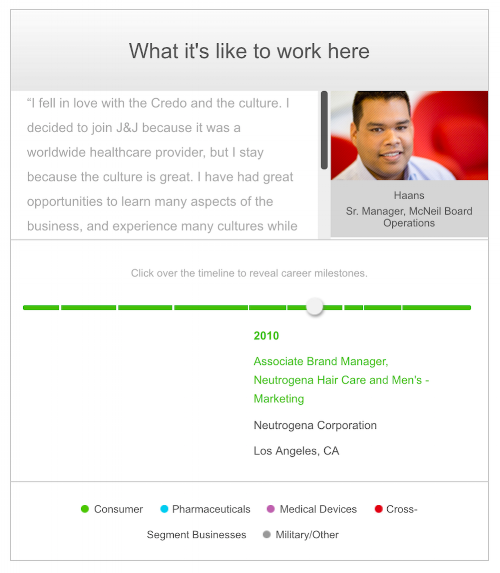 Using interactive timelines on employee profiles is an interesting idea, but badly executed. Employee profiles on Johnson & Johnson’s careers microsite have interactive timelines displaying career histories at the US pharmaceutical and consumer goods giant. For example, the timeline for ‘Eddie’, who is director of university relations, has three clickable red blocks, each representing a different job at the company from 2005 to 2013. The blocks are colour-coded according to department – consumer, pharmaceuticals, ‘cross-segment businesses’, etc. Clicking on the blocks reveals basic information about the job – year, job title, department, company and location. The timelines have a lot of weaknesses. Usability is confusing – visitors are instructed to ‘Click over the timeline to reveal career milestones’ – but it is unclear at first where exactly to click to reveal a new milestone. The ‘milestones’ themselves are uninspiring, just a list of basic facts. The colour-coding key to different business segments seems odd when the employee has only worked in one department. On the plus side, the company is trying to demonstrate the opportunities for career progression, and that does come through in some of the profiles. For example ‘Jeanne’, talent acquisition vice president, has been at the company since 1978 in a variety of roles. The timelines are more a missed opportunity than a flawed concept. A better, modern design, with multi-media elements and more interesting editorial (descriptions of achievements, why they went to a different role, the challenges they faced, etc), in a timeline format, could engage potential jobseekers rather that leave them wanting more. A UK retailer’s online job search does its best to hide the results. The vacancy search engine on the John Lewis careers microsite has five filters – for divisions, job type, region, etc and a keyword search box. Next to the filters is a long text column that extends below the scroll line on a standard desktop monitor, with an introduction explaining that the engine covers jobs across the retail group, including supermarkets, motorway services shops and the head office; a phishing scam warning; and further notes about how to apply and sign up for alerts. When jobseekers fill in the filters and press ‘search’, the page reloads but it is not immediately clear that any results have been returned. Only when scrolling all the way to the bottom of the page – underneath the warnings and notes – will users discover a series of panels describing the company’s current vacancies. On a smartphone screen, the results also appear at the bottom of the page. The John Lewis job search engine takes the assumption that ‘people will scroll’ to new limits. In our tests we initially thought the tool was not working. There are no instructions to scroll down the page to find the results, and visitors are simply left to hunt for them. 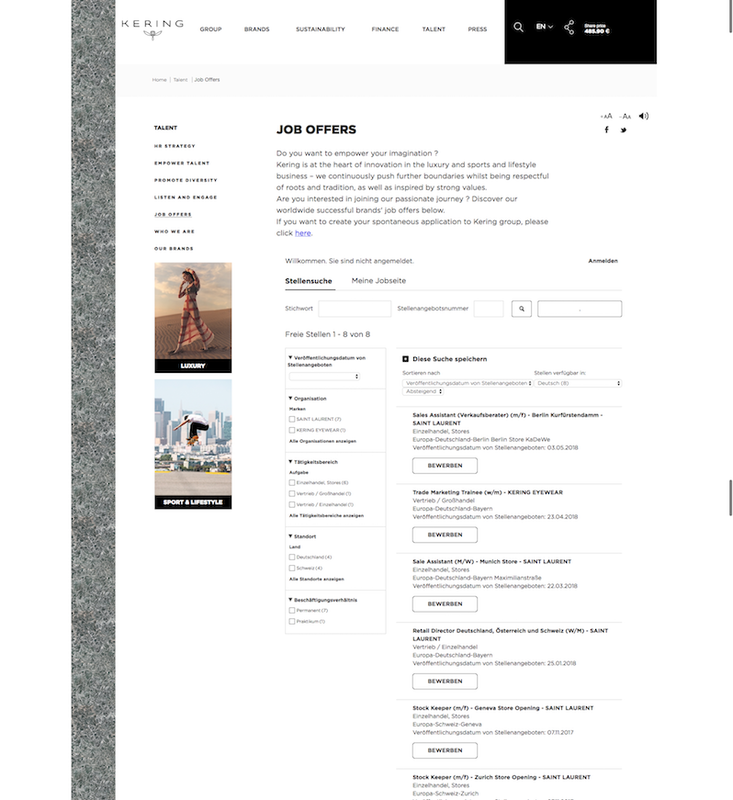 The page design does not help matters; the filters and text are on a grey background, which switches to white for the vacancies, making the section look like a footer. Even jobseekers who eventually find the results listing will be frustrated; others may just give up. Pew Research recently published its findings about how Americans use the internet to search for jobs. The weight of evidence has so far suggested that when it comes to job searches and mobile devices, people are more likely to seek information on their mobile device (browse jobs/see what the company is like), and leave the complicated business of filling out the application until they get to a desktop or laptop. It seems more Americans (esp. young Americans) are trying to actually do their resumes/CVs and fill out online applications on the phone itself. Pew says of the 28% of Americans that have used a smartphone in a job search, half of these have tried to fill out an application on their device, and about a quarter have tried writing their CV. Maybe not surprisingly the report says they are finding this a frustrating experience. The question for companies is should they attempt to respond to this trend in some way, by making it possible/easier to fill out mobile applications on their websites, or if by doing so they degrade the desktop experience (a real danger in the age of responsive sites). Certainly less complexity in corporate online applications could benefit users of all devices. Something tells me that, like with most other online trends, the question is not ‘either/or’ but ‘both’. In other words, they’ll need to try to cater for everyone – the rising mobile awkward squad and the ‘desktop dinosaurs’. The corporate communications world has long treated LinkedIn as the Cinderella of social media channels. While companies poured time and money into their Facebook, Twitter and YouTube presences – often with decidedly mixed results – their LinkedIn pages remained rather neglected. Sure, HR people knew that LinkedIn was an important recruitment tool. But their communications colleagues didn't really see it as a primary channel for them. I don't think that LinkedIn's 'suit, tie and firm handshake' image has helped. Nor has the fact that so much output from the 'go social or die' school of digital gurudom focuses on brand marketing, for which the likes of Facebook are natural fit, rather than corporate communications. Now, though, more online corporate communications teams are finding 'the world's largest professional network' to be their most powerful social media channel for driving traffic to their site and spreading company news. The digital head of one major multinational said recently he'd been staggered by how much traffic his firm's LinkedIn pages are driving to material on the corporate site – and was particularly impressed by how a new LinkedIn feature, called Elevate, can encourage employees to spread company output around their own networks. (More on Elevate here). He's not alone. In a Bowen Craggs survey for our new report on content strategies, 62% of digital managers predicted LinkedIn to grow in importance over the next 12 months – more than any other channel apart from the corporate website itself (see the chart below).